CHARLOTTE, NORTH CAROLINA - Hideki Matsuyama missed his chance to become the first Japanese man to win a major when he finished in a tie for fifth at the PGA Championship on Sunday, three shots behind winner Justin Thomas. Matsuyama, who went into the final round one shot off the pace, finished with a 5-under 279 total at Quail Hollow, with a wild three-birdie, five-bogey final nine ending his charge. He closed the tournament with a 1-over round, as errors, including finding the water with his drive on 18, cost him the chance to challenge Thomas who won his first career major and fourth tournament of the season. “I have to work on my mental game. 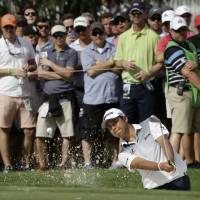 I had a feeling I’d play better than I did yesterday but it took some time to find my rhythm,” said Matsuyama. “I want to learn from this experience, but I don’t know what it is that I have to do in order to win. I want to be the kind of player who can win,” he said. Matsuyama opened his round with a par, but in a sign of things to come, dropped a shot on the second after a poor chip left him too much to do with the short stick. He settled his nerves with three straight pars before birdies at the sixth and seventh put him in a tie for the lead at 7-under. Overnight leader Kevin Kisner’s fall began on the seventh when he sliced into the water, leaving Matsuyama alone at the top. He went to 8-under with a long putt on the 10th but fell back into a four-way tie for the lead with a short missed par putt on the next hole. A string of three consecutive bogeys between 11 and 13 dropped him back to fifth, three shots behind Thomas, before birdies on 14 and 15 put him back in the hunt. Matsuyama found the heavy rough with his drive on 16, eventually carding a bogey, and when Thomas knocked in a sizable birdie putt on 17, the tournament was his. The 25-year-old Matsuyama missed out on equaling his previous best at a major, a second-place finish achieved at this season’s U.S. Open in June. The Ehime Prefecture native shares the best major result for a Japanese player with World Golf Hall of Famer Isao Aoki. 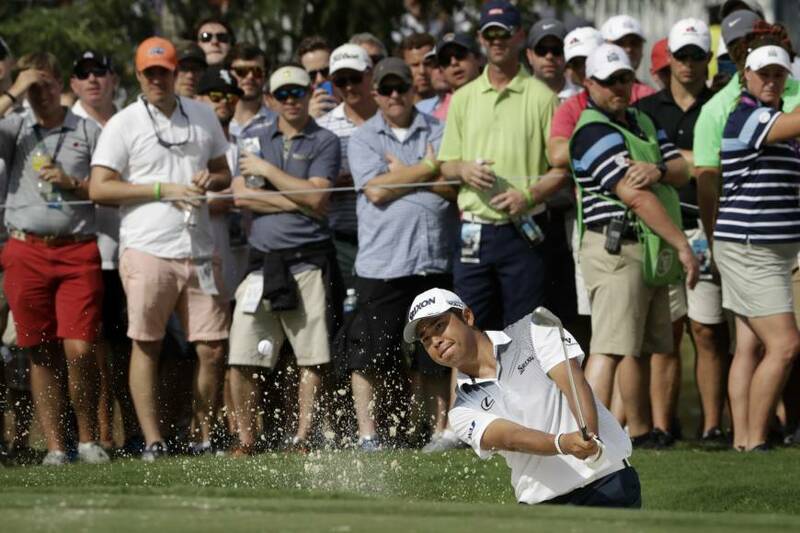 Matsuyama now has seven top 10 finishes at golf’s four majors, the most by a Japanese player. He has five career wins on the PGA Tour, including two World Golf Championships victories. 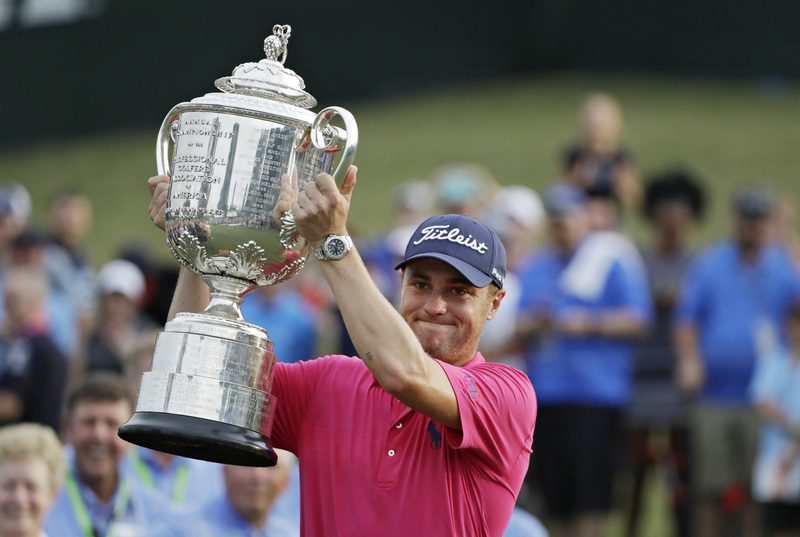 Thomas closed with a 3-under 68 to emerge from the shadow of Jordan Spieth, his longtime friend, and capture his first major, which belonged as much to him as to the two generations of PGA professionals who came before him. The week began with Spieth’s quest for a career Grand Slam, and ended with him at the 18th green late Sunday afternoon. Only it was so he could celebrate the moment with Thomas, close friends since they were 14. “So awesome, dude,” Spieth told him. Thomas was every bit of that. 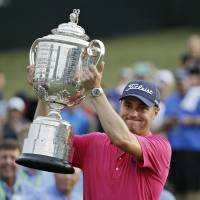 With five players still in the mix on the back nine, Thomas surged ahead by chipping in for birdie and holding his nerve down the stretch as his challengers eventually faded, one after another. Louis Oosthuizen (70), Patrick Reed (67) and Francesco Molinari (67) tied for second, though none had a chance to win playing the 18th. Oosthuizen holed a 50-foot birdie putt on the 18th that made him a runner-up in all four majors. For Reed, it was his first top 10 in a major.